Today we are treated to our first taste of what to expect from Wes Anderson's latest stop-motion film "Fantastic Mr. Fox" based off Ronald Dahl's book of the same name. The image premiered on JoBlo this morning featuring Mr. Fox voiced by George Clooney, Mrs. Fox voiced by Meryl Streep and Badger played by Bill Murray and is a definate throwback to animation used in late 70's. 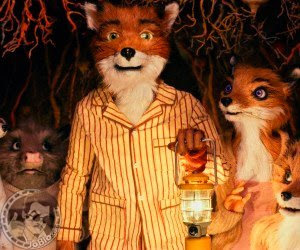 "Fantastic Mr. Fox" is slated to release November 13th through Fox.